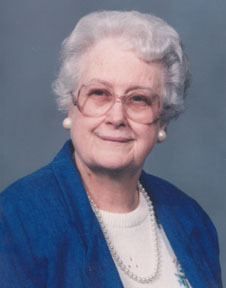 June M. Kutzke, 86, of Cortland, died Sunday, April 17, 2005, at 8:00 a.m. in Forum Trumbull Memorial Hospital. Born June 20, 1918, in Toledo, OH, she was the daughter of Marshall W. and Rachael Navarre Lloyd. Mrs. Kutzke was a graduate of The University of Toledo where she earned a Bachelor of Arts and Masters Degree in Education and also her Juris Doctorate Degree. She was a schoolteacher at Perrysburg High School and the Toledo Whitmer High School for 25 years before her retirement in 1980. She was a self-employed practicing attorney for 12 years at Kutzke-Goldberg where she was associated with Atty. Harriet Goldberg in Toledo, OH. During her college years, she was a member of the Phi Kappa Phi Honorary Society and was a member of the Alpha Chi Omega Sorority. Other organizational involvement includes the Yondoti Chapter Order Eastern Star in Toledo, the Dendarah Court Ladies Oriental Shrine and the Wapaukonica Rebekah Lodge in Toledo and the American Association of University Women of Warren. She was a member of the Emmanuel Lutheran Church, enjoyed reading and music, her summer cottage at Kelley's Island on Lake Erie, and crocheting. She married William Kutzke on August 26, 1939. They shared 60 years of marriage before his death in May of 2000. She is survived by a daughter, Mrs. Garland (Ruth) Bradshaw of Warren; a granddaughter, Rachael Bradshaw of Las Vegas, NV, and a brother, Dr. Robert B. Lloyd of Lynchburg, VA. She was preceded in death by her parents and a brother, William H. Lloyd. The Rev. Kelly Faulstich will conduct a funeral service on Saturday, April 23, at 10:00 a.m. at the Emmanuel Lutheran Church in Warren. Calling hours will be one hour prior to the service from 9:00 to 10:00 a.m. at the church. Burial will be at the Hillside Cemetery in Cortland. Material contributions may be made to the Emmanuel Lutheran Church at 140 Cherry NW Warren, OH 44485. Arrangements have been entrusted to the Roberts-Clark Funeral Chapel. CORTLAND - June M. Kutzke, 86, of Cortland, died at 8 a.m. Sunday, April 17, 2005, at Forum Health Trumbull Memorial Hospital.